If you’re looking for a second home or investment in a vacation rental, Caribe Cove Resort in Kissimmee is an excellent choice. Located just 10 minutes from Disney’s main gate, Caribe Cove offers two and three bedroom condos for sale on a beautifully landscaped, gated property. This Osceola county community features a number of resort amenities for residents and guests to use, including a lakeside heated pool, hot tub, fitness center and 24-hour market. Check out the available Caribe Cove real estate listings below! Want to learn more? Click here for more information, or contact us online to reach a Caribe Cove condo specialist! Price Reduced!!! This Beautiful 3/2 Condo Is Located In The 1st Floor. The Master Bedroom And Living Room Leads To A Private Patio With A View To The Conservation Area. Comes Fully Furnished!! The Community Has Many Amenities That Includes A Fitness Center, Clubhouse And Pool. Minutes Away From All Attractions And Restaurants. Caribe Cove is a family-friendly community that’s great for people who want to be close to the fabulous theme parks, entertainment and fun attractions that Orlando has to offer, yet want a quiet location to enjoy some peaceful downtime. The community features a variety of amenities for residents and guests, including a community pool, hot tub, sauna, and 24-hour fitness center. The resort’s clubhouse balcony features awesome views of Disney’s nightly fireworks display. Caribe Cove has an advantage over other condo communities in the area – its residents and guests can also enjoy the facilities at Caribe Cove’s sister resort, Bahama Bay. Located a couple of minutes away, Bahama Bay offers fabulous resort-style amenities including 4 heated pools, an on-site restaurant, Tiki bar and pool-side bar, a man-made sandy beach on the edge of Lake Davenport, a fishing dock, tennis and volleyball/basketball courts. Condos make great vacation rentals because your guests can save money by shopping at nearby Publix or Wal-Mart for groceries and fix home-cooked meals. On those occasions when you want to dine out, there are plenty of restaurants within two miles of Caribe Cove, including Red Lobster and Chili’s, as well as places to grab a quick meal like McDonald’s and Taco Bell. Buyers at Caribe Cove can choose between a two bedroom, two bath villa with 1,445 square feet of living space or a three bedroom, two bath villa with 1,700 square feet of living space. 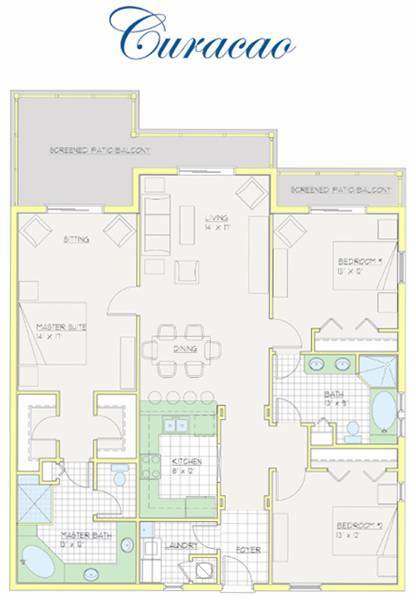 Each condo features its own screened-in private balcony with access from the master suite. 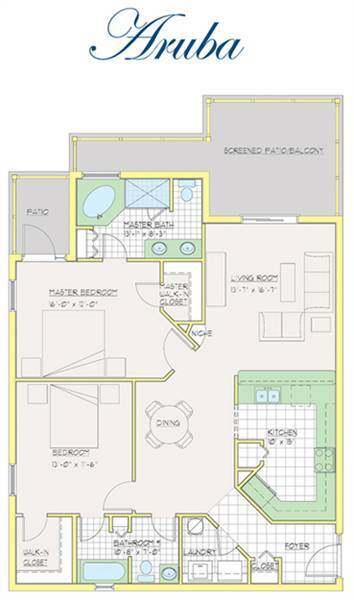 A spacious open floor plan in each unit includes a generous sized kitchen and comfortable living room. The condos come fully furnished and are move-in or rental ready. For more detailed information about the condos for sale at Caribe Cove, please don’t hesitate to call a Team Donovan agent today at 407-705-2616 or contact us online. We are happy to share our knowledge of the Orlando vacation home market with you at no cost, and without any obligation.